$98 in hardcover seems high to me, although I suppose it is due to having a lot of illustrations which make it expensive to print. $35 would have been an immediate sale, but there are so many worthwhile causes (including this website) which could use $98 that I hesitate. Although I have a niece whom I could give it to as a high-school graduation present in a few months. (I usually go with Simon Singh's "Big Bang" - plus some legal-tender "bookmarks".) Thanks for the review. Thanks for your interesting reviews! Just out of curiosity: which science books written by women would you recommend? I realized I have a lot of great (semi popular) economics books written by women but no physics books. But they should exist, because at Gresham College there are several nice podcasts by women in "hard science". The strapline, "how humans looked beyond the galaxy and found the whole universe" should be perfectly fine, yet quite involuntarily one is left with feelings of non-specific daftness anxiety. Like maybe they fell down a manhole and thought it was the whole universe. "$98 in hardcover seems high to me, although I suppose it is due to having a lot of illustrations which make it expensive to print." I review (mostly cosmology) books from time to time and find that there is little correlation between price and number of (colour) illustrations. For example, this coffee-table book has high-quality colour illustrations on most of its 321 pages but is priced at only $50. I just finished reading this book (hardcover, $23 on Amazon Prime), due to the recommendation here. 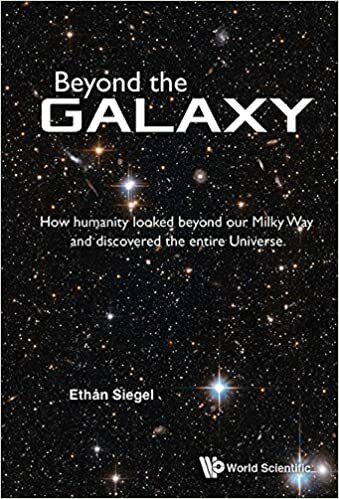 It is an amazing book: the detailed history of how Ms. Gefter went about gathering ideas and pondering them to arrive at a personal understanding of how her universe works, over decades of time, having started with that goal at the age of about 15; and despite having avoided math and physics courses in school. As a work of fiction I would have found it unbelievable. I myself have evolved a similar (but not identical) paradigm, but would be unable to give such an accurate, chronological, well-sourced, well-written history of its development, full of amusing anecdotes. One point which I would like to argue with Ms. Gefter is her constant use of "observer" and "observations" to define reference frames. No doubt this is conventional usage by the wise, but I would prefer "interacter" and "interactions". As a compromise, I would be willing to settle for "measurer" and "measurement" as less anthropomorphic/dualistic substitutes. The use of "observer" smacks of dualism to me. Many of the wise people she cites, such as John Wheeler, seem to favor some mild sort of dualism, so I could be wrong to oppose it. I will not say no evidence could convince me of its existence, but I will say convincing evidence would annoy me considerably. Of course one of the points of Ms. Gefter's interesting book is that no two "observers" are compelled (by physics) to agree totally about the nature of their universes, so I hope she would not be offended by my slight disagreement. Anyway, I give her book five stars. Thanks for the recommendation.